The bond of a Guru and disciple is beyond any imaginable relationship. Most of the time, this is understood by the just the mind due to the heavy curtains that the mind and sanskars put upon the soul. It is for so many lifetimes that this bond is created over. i know of few friends of mine, who never knew anything about Baba but suddenly had strange affinity towards Him and His teachings (just like i had in 2008). Many of them do not even know who the person (Guru) is but still find themselves being guided. i have a couple of friends who are connected with Babaji more subtly. They have not attended shivirs, but they find His guiding light in their lives. He comes up in their dreams, guides them in various ways, comforts and heals. Some end up having kriyas and emotional outbursts that among new sadhaks are normally seen only in the physical presence of the Guru. Some just watch him on TV and find a nourishing Guru-Shishya relationship. This goes out far to clearly indicate the subtle presence of the Guru even when the disciple may not understand or see or decipher it at all. When i look back into my years long, long before i came into ShivYog or even knew Baba in any way, i see a very strong connection and understanding of experiences that now reveal to me that i was watched over even during those times. 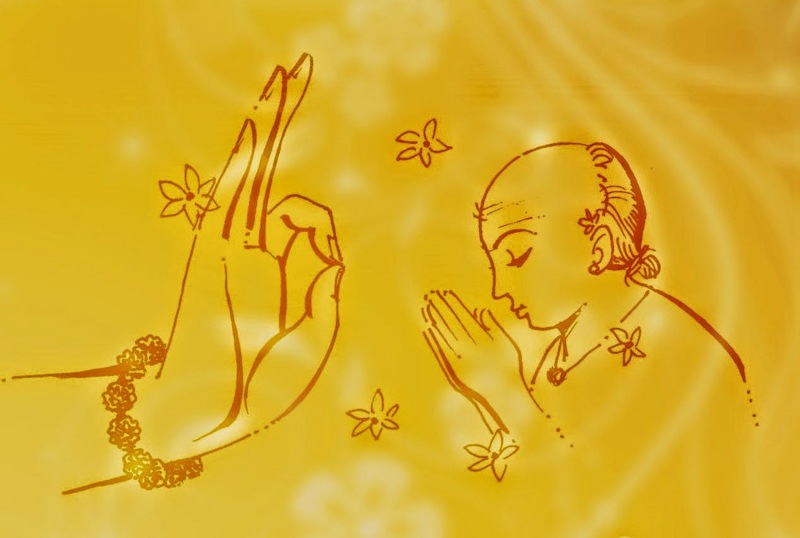 The experiences that seemed weird in those years, only became clear to me when similar experiences i witnessed after meeting my Guru, which clearly indicated in many, many ways that it was the same subtle presence then and today. i had read of how the Guru follows the soul, lifetimes over, especially when the soul has deviated from the path of Light, like a lost sheep from the flock, but i realize it all only now. Guru is not actually the person we see, that is just a body of this life time. 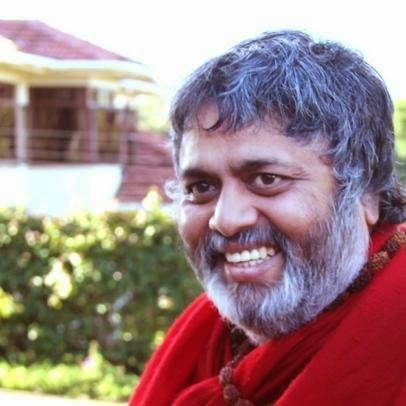 Guru is that divine soul who has changed bodies just like you and me have changed, only as the means to catch up again with the souls The only difference is that we come each time, knowingly or unknowingly, out of our unfulfilled desires and strong impressions that tries to manifest itself through various lifetimes. And the Guru comes not for His own, because He is done with it all. He now comes to remind you of what you left pending last time and where you could not make it. While we forget that our birth itself is an attempt to achieve freedom from it all, the Guru comes with an attempt to make that attempt possible. With the natural laws prohibiting the Guru from direct interference into the freewill of the soul, the Guru tries all possible ways to reach the souls in order to awaken and shake them off the dream of the illusory life, that can again make the soul wander or fall. Even if found, it is still a task to keep one awake from the deep slumbers of karmic substance. This is why this relationship can never replace any other. It takes a fraction of time for the Guru to return back to source for He is all liberated but out of sheer love, compassion and unconditional love chooses to linger around and trying to do the maximum possible. When the time comes, and the soul has dealt with certain amount of karma destined in it's prarabdh, the lost link of previous lifetimes is re-established with the Guru. All the reasons to bring a seeker and Guru together are just reasons and the play of the Consciousness, which might feel like a strange inclination or a unknown fascination or a feeling of knowing the Guru or familiarity with various aspect of the Guru or an untoward incident that propels one to the Guru or an urge to do something for Him or a feeling of connectedness in the very first meeting or a moment of ecstasy or emotions when seeing or hearing about the Guru or one may call it simply it a coincidence of having come to the Guru. Stories may be a thousand but the reason is just ONE. We look at stories because it fascinates us but He knows it before the story has even unfolded. He is not excited about this story or meeting for this has happened many times before, He is only happy that He has another opportunity the present time and He is only eager to know your eagerness for that is what will accelerate His willingness to help. This is why scriptures also say that it is not you who finds the Guru but it is the Guru who finds you. 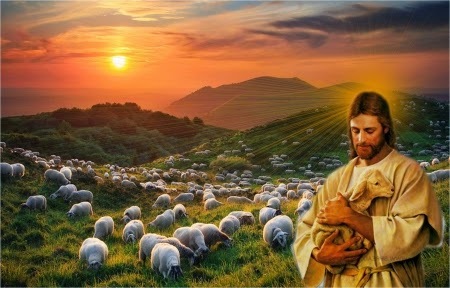 Jesus Christ, as i knew Him from childhood, is known as the Good Shepherd, who is most of the time depicted being among grazing sheep and often shown with a sheep around His shoulder. 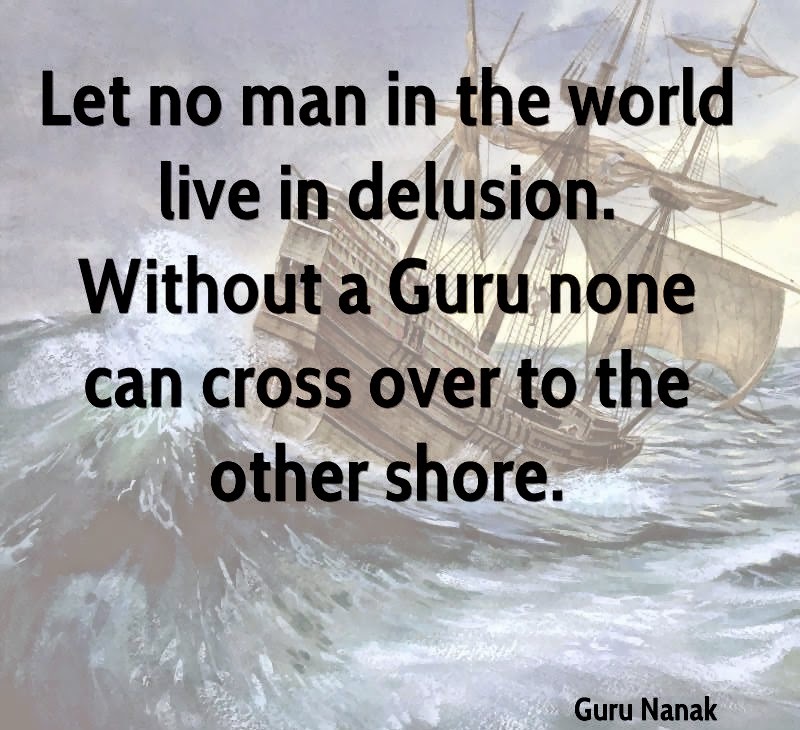 This has a very deep meaning with and is similar to what a Guru is. He has the commitment of that of a shepherd when it comes to taking care of it. He guards over them. He is alert over them. Many a times, He goes in search of the sheep gone astray and brings them back untiringly one after the other. In the Bible there are thousands of times the word Shepherd is referred to. One of the most popular parable in the Bible is "The Lost Sheep" where it is quoted as "What do you think? If a man has a hundred sheep, and one of them has gone astray, does he not leave the ninety-nine on the hills and go in search of the one that went astray? And if he finds it, truly, I say to you, he rejoices over it more than over the ninety-nine that never went astray. So it is not the will of my Father who is in heaven that one of these little ones should perish." Here, souls are referred to as sheep and in the scripture it says that God will send a Shepherd to take care of the sheep. 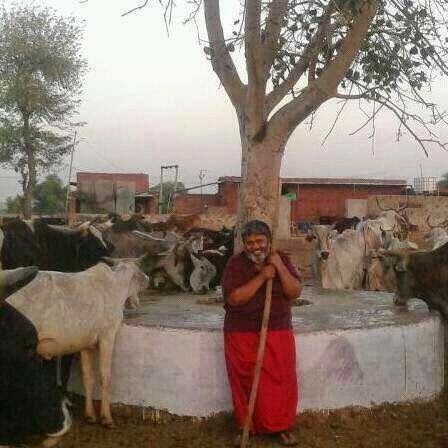 The Shepherd is the Guru in form. Now, there are all kinds of shepherds and that is why Christ is referred to as the GOOD SHEPHERD. Shepherds count their sheep every night. In these quotes, it says, what would happen when a shepherd came back by late evening with his 100 sheep after grazing only to find one sheep missing? The Shepherd does not rest after that. It leaves the 99 on the hill and goes in search of that one that is lost. And when that one is found, he rejoices over it more than the 99 who never went astray. It ends with the quote that it is the will of God that not a single sheep should perish. Now, for that reason the Divine assigns this humongous task to a Guru. This i could relate is so clearly when Baba once in a shivir said, "It is natural for a mother who has many kids but runs to take care of the weakest." Here, He meant that He is more striving to take care of the weak for the strong are equipped enough to handle themselves. This is perfect what is in tune with the Good Shepherd who leaves the 99 just for that one sheep that is lost. Here, lost sheep means the soul that has wandered off the path or from one's objective of taking this birth. The Shepherd knows that lost sheep are more vulnerable to the wolves and fierce weather. The Guru's purpose of incarnation itself is to search the lost lambs and bring them to the path of light. And what joy the shepherd has when He finds the sheep and brings it back in His arms and this is why He rejoices more when the lost are found, more than the "found" are found :) That is why Jesus was popularly known to be among sinners. Sinners are the karmically burdened. The human being is not capable of handling one's own karmas and here are the mighty enlightened souls (Guru) who manage with thousands of people's karma, which is not at all a human task, but can only be managed by those who are chosen by the Divine themselves. When Baba Nityananda was once questioned as to why when He was such an elevated being, how come the society in which He lived in was so bad, to which Baba answered, "Why would I need good people?' which speaks volumes of the work of fire of the Chosen ones. They come not to sit and rest. They toil for others. What they make, they don't even sit back and relish it, but is all put back to certain causes. Baba is always on the move, touching every area of life with His Midas touch as Ishan bhaiya calls it. Anything He touches bakes, because His touch is fire, sooner or later, it has to bake. To us what seems like being baked in a few months or years is not true. It has taken baking for lifetimes, it is only that the souls were left half-baked which only has continued in this lifetime, which may be seen or not even known, but that is the way it is. It is unimaginable to know what patience must have gone through the Guru to persistently bake a soul over lifetimes, never ever giving up. This is what makes a Guru special for His only agenda is to bring lost souls to the path. This He does by shaking all the myths and comforts of illusion in various ways that are not often easily understood by the thinking mind. They may be understood, not understood or half-understood, it still does not matter to them for they see the whole picture clear. This is why the bond between a Guru and disciple is most precious. Who else can take this kind of care and compassion for souls? It is not easy for them as well because for this divine task to undertake, they themselves go through a lot. The soldier is battling at the border to safeguard his country while his countrymen are lying in the comforts of their beds, partying, and in merry spirits, safe and sound. At this same time, there is a soldier who is facing harsh climatic condition, surviving through all odds, and risking everything. Wonder what makes a soldier not think that it would have been so better choosing another career of comfort. It is not so for them, because they have a different force within them that sees things more than themselves. The biggest thing that a soldier offers is sacrifice, not just life, but everything - in return for someone else's good. That gives meaning to their lives and they are happy about it. Gurus are extremely happy themselves for the cause that they undertake to live in the human body, which is so limiting to them. The human body confines their vastness and subtleness into various limitations when gross, yet they are willing to come down the grosser planes because on the grosser planes are many souls struggling to liberate. God frequency is such unimaginably high that it is not so easy for a lower vibration to even come close, though the divine will is so. The more gross, the more far. 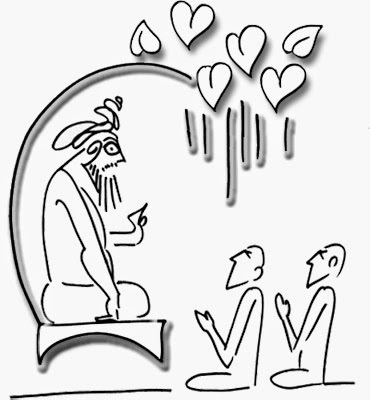 This is when a mediator arrives - the Guru - who lives in the best of both worlds and who can relate and act as a mediator to connect these two extremes. This is why the role of a Guru is treated very sacred in the Sanatan Dharma. Very high reverence is given to the Guru who plays such an important role to souls, without whom, who knows, when and how a lost sheep can find its way back. It is a vast sea out there, where a soul can easily and hopelessly adrift in the sea of uncertainty. Without a sense of direction and a sense of path, to be alone, lost, and disoriented can be the worst thing that can happen to a soul. How grateful would we feel to have a guide who could show the way back home in the best possible way? Yet, we may not realize how fortunate we are, because the worth of it still lies muddied under various karmic forces and subtle impressions. But yet, a Guru is never bothered about it all for He knows why you are what you are. He knows why you don't see what you have to see. And, because of this very special quality of His, He is an eternal embodiment of sheer patience springing from unconditional love. He expects nothing in return except the eagerness to walk the path. For then, it is easier for Him or else He waits over the laws of non-interference with the only a steady gaze that still prefers to keep watch over, steadily praying for the lost souls. Such great and vast is the heart of the Master, to whom whatever we give can never ever be repaid back, as the scripture rightly quotes. Earnest bow of Gratitude! Shri Gurubhyo Namaha!